Tim Field, Partner at KOMAND Consulting, coaches JMSB at the 2015 MBA International Case Competition | KOMAND Consulting Inc. 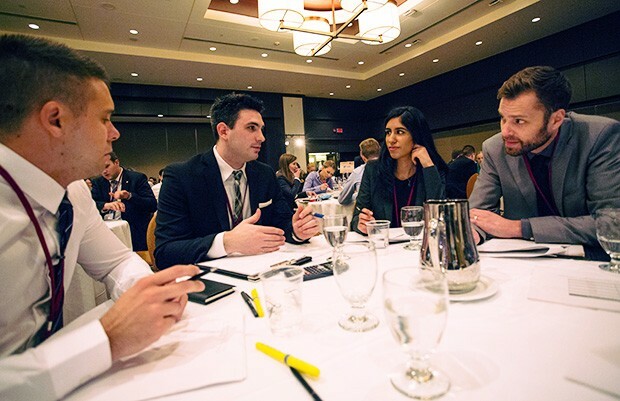 The spacious, carpeted byways of the Fairmont The Queen Elizabeth Hotel are abuzz with activity this week as Concordia welcomes more than 150 graduate students from all over the world for the 34th John Molson MBA International Case Competition. In the words of Tim Field — coach of JMSB’s five-student team, business strategy consultant and senior lecturer in the Department of Management — the annual event is the Olympics of case challenges. “The level of competition, the level of judging, the level of organization: it’s the gold standard,” he said on Tuesday, fresh from the excitement of his team’s second case presentation to a panel of judges. This year, the student-run competition runs from January 4 to 9; each team presents five cases to qualify for the semi-finals on Thursday, January 8. JMSB team members Matthew Beck and Elliott Altilia, both avid sports fans, were delighted with the chosen subject for the second case, which challenged the students to develop a business plan for the Paris Saint-Germain Football Club. “We wished it had been about hockey not soccer, but we were happy to take what we could get!” Beck said, laughing. The highlight of the week so far, according to Bill, was a dinner at a downtown restaurant where attendees were required to sit with competitors they hadn’t yet met. “I was surrounded by four people from four different continents,” he said. “That’s exactly what this case competition is about.” Other events on the schedule include a networking cocktail with industry professionals and an outing to watch the Canadiens play at the Bell Centre. 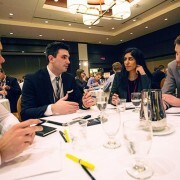 The theme of the 34th edition of the John Molson MBA International Case Competition is “Global Connections — Sustainable Future.” Roberto Blanc, a JMSB grad student and one of the organizing committee’s four members, explains that as well as creating a strong networking platform, they wanted to bring eco-consciousness to the forefront. “Our competition is basically a place to foster tomorrow’s business leaders, so they must be aware of their impact in the world,” he says. The 2015 organizers took numerous measures to reduce the competition’s environmental cost, including using vegetable-based ink in their printers; sourcing locally produced, organic food for on-site meals; and planting a tree in the name of each of the 270 judges — all of whom are senior-management-level business professionals. This year, the alternate members from each school’s team were also invited to apply for a position on a global team. After the line-up was selected, the team prepared for the competition on Skype. During the live case portion of the competition, top executives from a real company present their business case. This year, Lufa Farms — a Montreal company that builds and operates greenhouses on the roofs of industrial buildings — challenged the 36 teams to come up with a plan to grow their business to $100 million in five years. Teams have three hours to prepare their recommendations for the company. The JMSB team defeated the Münster School of Business and Economics by a score of 26 to 15 in the live case round. The Concordia students also beat the defending champions from the University of Minnesota’s Carlson School of Management by a score of 39 to 2 in the fifth and final case of the preliminary round. They will presents their semi-final recommendations to judges Thursday, January 8 at 6:30 p.m. in Room Hochelaga 4 at the Fairmont The Queen Elizabeth Hotel. Friday is finals day, when the top three teams in the competition face off against each other for the title. All final presentations are open and free for the public to attend. It’s too soon to say whether the JMSB team will be in the mix. 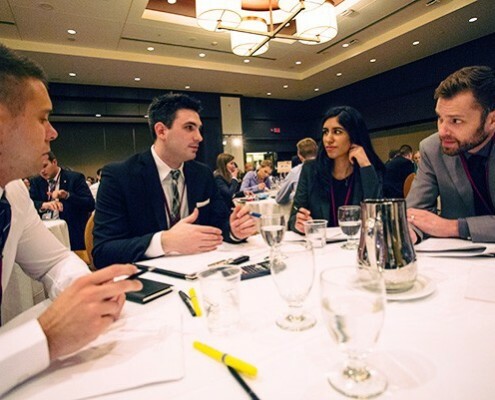 Either way, as Altilia says, competing in the John Molson MBA International Case Competition is an incredible learning experience. Download Brochure page 55 (Tim Field).